Think you your backyard as an extension of your house. That worn and cracked swimming pool and deck is the foundation. Backyards n More would like to help you create a better living area a better foundation for a better backyard experience and more. The pool and deck is the best place to start when redesigning or creating a better backyard experience. Our job at Backyards n More is not to high pressure sell you a project but work with you and educate you on all designs, materials and options available. You will work with me (Philip), the owner, on renderings, layout, and material options. We will together create another room in your house that you can enjoy year round. When creating this area we have to know our boundaries, perimeters and set backs. This is usually found on the survey. Once we have our set backs, property lines and your guidance we can get creative as we like. Maybe you want to extend the deck area, add a beach entry or bench in your swimming pool, add a spill over or water feature, Backyards n More can help make this a fun and exciting project. Enjoy our gallery of ideas for your next paver project. Stabil Concrete Pavers manufactures their own concrete pavers from the finest materials in a state-of-the-art manufacturing facility located in Sarasota Florida. Stabil offers a wide variety of popular shapes, colors and sizes to satisfy your residential and commercial paver needs. If your backyard project needs coping to walkways or a remodeled pool deck come see Stabil’s full product line. Oldcastle Coastal is your complete resource for Masonry and Hardscape products. 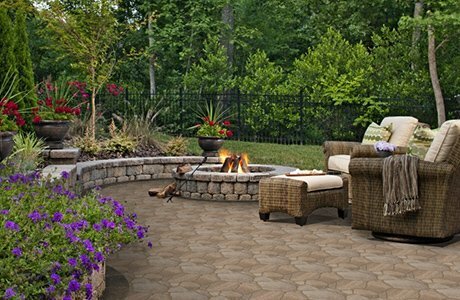 With quality name brands such as Belgard, Anchor Wall Systems, Pine Hall Brick and Interstate Brick. They take pride in manufacturing the best quality products and representing the premiere product lines in the market. Oldcastle also offer a diverse range of Green building products for the environmentally conscious.